888 Poker is one of the oldest and most trusted gambling brands in the industry, having offered iGaming services since 2002. 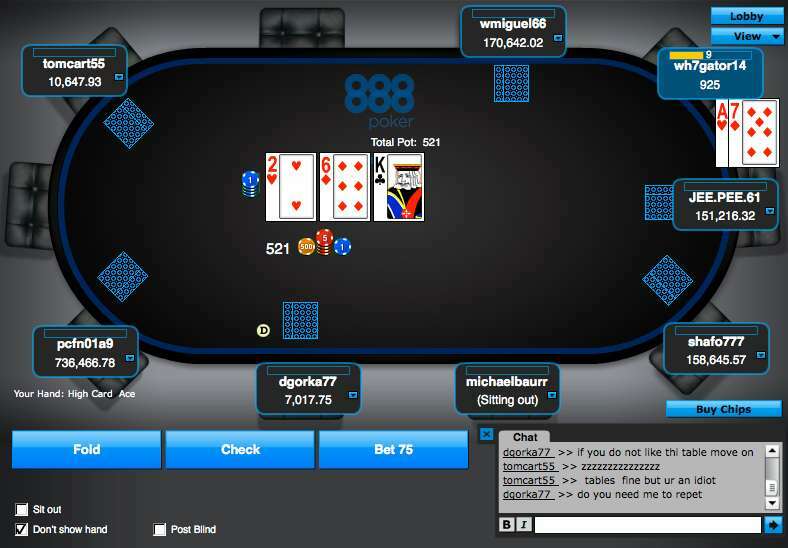 Formerly known as Pacific Poker, the 888 Poker brand was previously owned by 888 Holdings and then subsequently bought out by bwin.party in mid-2015. The company has since expanded its global reach by providing its software to several states in the USA that have regulated online poker. 888 Poker currently provides its gaming software to several states who have regulated online gambling – and more importantly, online poker. These states include New Jersey, Nevada and Delaware. 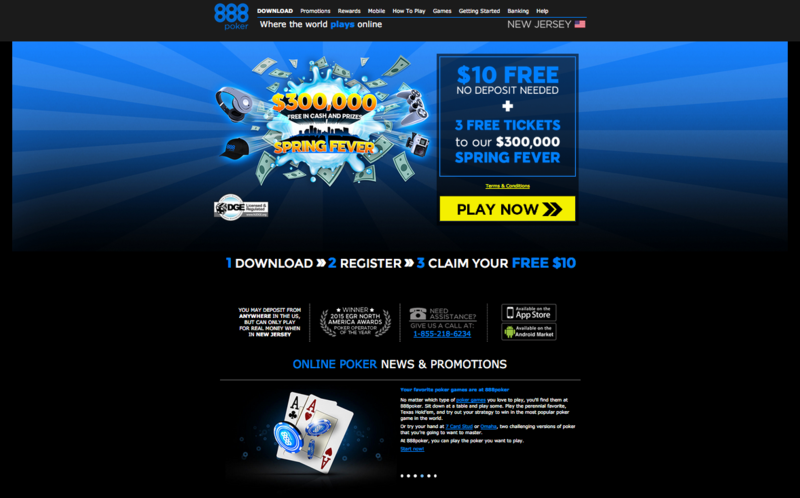 It’s important to note that 888’s brand name is only seen on their New Jersey poker sites, most notably 888 NJ. WSOP.com and 888 NJ also share player traffic to attract more action from all over the state. The 888 Poker NJ website is operated by Caesars Interactive Entertainment New Jersey LLC with licensing and regulation offered by the New Jersey Division of Gaming Enforcement. As far as Delaware and Nevada are concerned, the 888 poker platform is used by Delaware’s 3 poker skins and the WSOP.com NV brand. There are no immediate plans to feature the 888 brand itself in these two states. Shared player pools with WSOP.com NJ ensure solid amounts of daily real money traffic. Cross promotions with Caesars AC involving free room stays and more. Cashback/rakeback rate is low compared to the high amount of rake needed to attain higher percentages of it. There are two promotions currently offered for new members of 888 Poker NJ. Players can access a $10 Free Bonus to earn free cash with no deposit or use the Welcome Boost bonus to earn extra cash, as much as $888. When you join 888 Poker NJ, you will be given $10 in registration bonus which can be used to play poker games at 888 poker. The free bonus allows you to try online poker free of charge, to get a feel for what poker games the brand provides. Once you register, an email will be sent to you that offers a link to receive the bonus cash. Simply click on the link and your bonus will be placed into your account. After joining 888 Poker, you will be ready to make a deposit. 888 offers you a double deposit bonus, worth up to $888. Each dollar you deposit will be matched by the online poker room. After making your deposit, begin playing real money poker to earn Bonus Points. Every time you earn 100 bonus points, you will be given $10 in bonus cash. You can even earn Bonus Points during casino game play to help you clear the bonus quicker! The reward program at 888 Poker will allow you to earn quality rewards while you enjoy your favorite poker games and tournaments. Compete in SNG’s, multi-table tournaments and cash games to earn Status Points, as well as Reward Points. The Status Points will help you move up through the various status levels while the Reward Points help you to earn rewards. There are six status options with the 888 Rewards program. ‘Blue’ is the first status which has zero Status Points needed. On this level, you will earn 2.5 Reward Points per 1 Status Point on this level which determines the amount of cashback you will receive. The second level is ‘Iron’ which requires 50 Status points with 4 Reward Points earn per 1 SP. Move up to the ‘Bronze’ level with 200 Status Points, earning 5 Reward Points per 1 SP. ‘Silver’ is the next level, requiring 3,000 Status Points and providing you with 7.5 Reward Points per 1 SP. ‘Gold’ requires 6,000 Status Points, providing 10 Reward Points per 1 SP. The last level of the rewards program is the ‘Platinum’ level which requires 20,000 Status Points, providing 17.5 Reward Points per 1 SP. Use your Status Level to earn access to rewards freerolls, with as much as $10,000 in guaranteed prize money offered on a daily, weekly and monthly basis. You can also earn cash back rewards based on the Reward Points earned. 888 Poker New Jersey offers a downloadable software platform that can be enjoyed via laptop or PC. 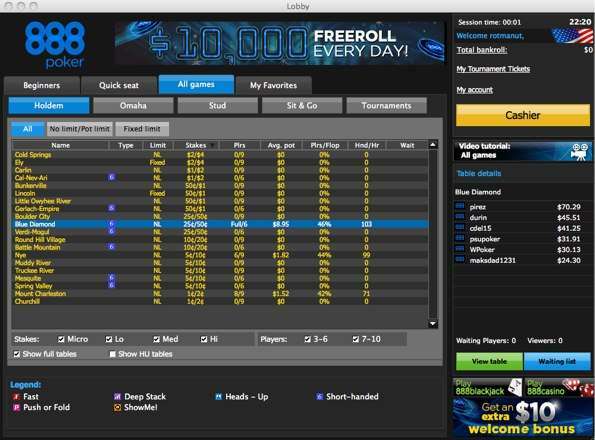 You can quickly download the gaming software by visiting 888 Poker and clicking the ‘Download Poker Now’ tab. The company offers some of the best graphics and playability options anywhere in the industry, so rest assured you’re playing experience will be absolutely perfect. When you open the lobby of 888 Poker NJ, you will find the information is laid out well, allowing you to easily navigate with filtering options such as table stakes, games, MTTs, SNG’s and more. From the lobby, you will have access to your financials, bonuses and reward info. You can open multiple tables and choose from the table settings for resizing, tiling and cascading features. The minimum resize option is 500×365 pixels and the maximum is the resolution that is offered by your screen. You can also use the chat feature to communicate with other players or disable chat to keep to yourself. The player notes feature can be used to keep track of player behavior and playing style. Hand tracking software can be used at 888 Poker New Jersey including Poker Tracker 4 and Hold’em Manager. As a side note, poker sites are constantly changing up their stances on HUD use so while this information may be current now, there is a small chance 888 Poker could ban PT4 or HEM at any time so please check in from time to time on the 888 website itself or simply email support if there are any questions or concerns about this. To get started with mobile gaming, new players to 888 Poker will need to download the poker app, which is available in the Apple Store or Android Marketplace, depending on your device. With the mobile application, you can log on to your account and immediately start playing SNG’s and cash games for play or real money. The poker games provided by 888 Poker include Texas Hold’em, Omaha Hi, Omaha Hi/Lo and 7 Card Stud Hi/Lo. Formats include Limit Hold’em, No Limit Hold’em, Pot Limit Omaha, Omaha 8 or better, Seven Card Stud 8 or Better and Seven card stud. Cash game buy-ins start at under $1 and can go as high as $10/$20, helping you to easily afford the varying levels of game play. Sit & Go tournaments are offered at 888 New Jersey with a variety of buy-ins and formats. The tournaments can be enjoyed by up to 50 players, with various options based on player number as well. The Multi-table tournament options of the site are quite diverse, with options including freeze-outs, rebuy/add-on and more. The site even offers MTT’s that are shared with the WSOP.com site to provide large guaranteed prize pools for the competition. 888 Poker New Jersey operates on the All American Poker Network which is a network created by 888. The network sees around 370 players in 24 hour peak times with the 7 day average rolling at around 200. Texas Hold’em is the most popular cash game options with players sticking to the lower to mid limits. Take a break from poker play and enjoy the 888 Casino, a site providing a nice selection of casino games including video slots, video poker, blackjack and roulette. Take advantage of a free $10 bonus or the Welcome Bonus offering 100% in bonus cash up to $300. Because 888 Poker is offering their services in New Jersey, the financial options are somewhat limited – but at the same time, much more accessible than trying to deposit at a non-regulated poker website. Many banks have still shown resistance to processing credit card or debit card transactions for users despite online poker being 100% legal in the state. There are a handful of deposit methods that can be used at 888 Poker NJ. Players can normally choose Visa or MasterCard to deposit, but there is that small chance that your bank could deny the transaction. While this inconvenience only occurs a small percentage of the time it’s important to know there’s a few more options you can try, which are listed next. Players can also choose a bank transfer to deposit is also an option and can normally be cleared into your account in a few days time. In addition, cash can also be deposited directly into your account via the cashier cage at any Caesar’s casino in New Jersey. Other popular options for deposits and withdrawals for NJ customers are PayPal or Neteller. While these two processors ban any type of gaming transactions coming from the United States, they are free to do business in states like New Jersey that offer legal gaming options. Bank Transfer: this can take up to 2 days to be accepted for withdrawal and as many as 4 days to be processed. Bank Draft: this option can take 2 days to be accepted and then take as many as 3 to 9 days to be cleared based on where you live. Casino Cage: a cash withdrawal via the casino cage is immediate and a popular choice when you are located near a Caesars property. Neteller: withdrawals only take about 3 days to process and is one of the safest eWallet options anywhere. PayPal: withdrawals take anywhere from 2 to 5 days to process and is more frequently used by customers than Neteller.